That’s a bad LED example, many have a ridge at the base with a flat/missing side on the negative. Also, the site states current flows from + to – I thought it was the opposite? I don’t think the tutorial directly tells you how to pick a limiting resistor. It spends a lot of time tiptoeing around it, though, and you’d be able to figure it out. A CR2016 button cell is a great way to find out the polariy of an LED because it delivers 3v with very low ampage, I go through a lot of them with my Micro PhotonLight keychain torches so I always have a few old ones kicking about, second to that if it’s clear I look at the insides. As the title mentions about, this tutorial is just for the beginners. It spends a lot of time telling the basic information that you’d figure out yourself. I’ve noticed that looking at the inside of the LED isn’t the best way of telling polarity. I have LEDs from Kingbright that are reversed on the inside, with the anvil being positive and the post being negative. I know I’m not looking at it wrong, as I have red and green set up in an 8×8 array with negative all one way, and the red leds are clearly backwards on the inside. The LEDs in my girlfriends ARDX kit are the same way. “Conventional current flow” is positive to negative. Current actually flows the opposite direction, but this wasn’t discovered for a few hundred years. So books stick with the “convention”. junk china surplus led’s are NOT always that way. I realize this is an intro, but isn’t it a disservice to refer to it as ‘positive’ or ‘negative’ leads? I saw this article and thought I’d see a flood of comments on this, but nope – still labeling it ‘positive’ and ‘negative’ leads of an LED. @kyle interesting, after a bit of reading “charge” cannot actually flow through metals (e.g. LED leads, solder, traces, wires, most battery terminals) thus all that’s possible is current. Am I understanding that right? Plus LEDs are current devices, though I don’t know if that’s relevant. Has anyone mentioned using LEDS as light sensors yet? When pluralizing acronyms please either use a lowercase s or an apostrophe ‘s (or no s at all if it’s clear from the context). By using a capital S you create a new confusing acronym instead of pluralizing it. I saw an interesting thing on a LED x-mas light, to make the light shine out more globular (I presume) they drilled a cone in the top of the LED so you also see it better from the side. Thought I’d share that observation in this LED topic because somebody might be able to do something with it. I have here some yellow LEDs from jameco which are actually backwards, having negative on the short lead inside the LED (usually positive is on the short end). 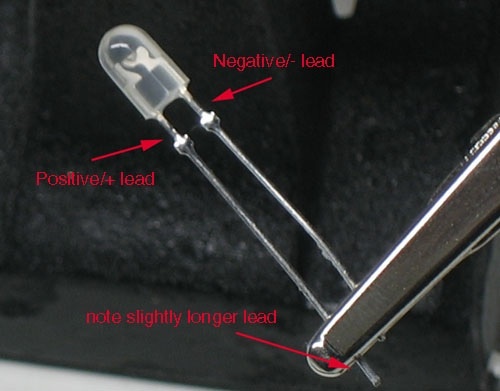 The longer lead is correctly attached to the positive end, but I had always been determining positive versus negative by looking inside the LED glass itself.